Dropbox is set be the biggest tech IPO since Snap (SNAP). Is the market hungry enough to justify the expected $7 billion valuation? Or, is this IPO how insiders sell stock and raise capital after the “smart money” (i.e. private equity, hedge funds, etc.) has dried up? Given Dropbox’s losses, fierce incumbent competition, and relatively small paying user base, the latter seems more likely. Dropbox (DBX) is in the Danger Zone this week. Has the “Smart Money” Dried Up? At the midpoint of Dropbox’s expected price range, its post IPO valuation would be nearly one-third below the $10 billion valuation it earned in 2014. Why would a tech firm with revenue growth upwards of 30% per year need to lower its valuation, if not to attract mainstream (non-insider) investors? Private markets are no longer interested. Could Dropbox’s IPO be another overpriced offering that leaves investors holding the bag? Look no further than Snap’s recent IPO for a cautionary tale on sell-side research. Dropbox’s multiple share classes and voting rights would lend further evidence that the firm isn’t truly interested in going public, in the true sense of the word. Following suit with Snap and other firms such as Facebook (FB), Dropbox’s share structure gives founders, executives, and early investors significantly more voting rights. Holders of class B shares (which are entitled to 10 votes per share) will hold 98% of the voting power following the IPO. Class A shares, which are being sold in the IPO, are entitled to just one vote per share. This share structure also means that Dropbox will be ineligible for inclusion in S&P and FTSE Russell indices, such as the S&P 500 or Russell 2000. Ultimately, Dropbox is going public and enjoying the benefits of an IPO (influx of cash) while giving away very little voting power to new investors. In addition, it will not benefit from inclusion in many ETFs and index funds. If IPO investors get little say in the way Dropbox is run, what are they getting? Certainly, not any profits. Dropbox’s revenue growth is slowing. Revenue growth dropped from 40% in 2016 to 31% in 2017. Paid users grew by 35% in 2016 and 25% in 2017, while average revenue per paid user has barely changed. Dropbox’s after-tax profit (NOPAT) was -$55 million in 2017 and Its NOPAT margin was -5%. The company earned a return on invested capital (ROIC) of -4%. Despite amassing a large user base over the past decade (500+ million), Dropbox has yet to monetize these users in a profitable manner. Dropbox’s income statement makes it appear as if the firm is rapidly approaching profitability. The company’s losses have declined, cost of revenue has fallen, and its revenue growth outpaces key operating expenses, such as sales & marketing. However, when you look beneath the surface and remove accounting distortions, Dropbox’s profitability is headed the wrong direction. The recent reduction in cost of revenue was a byproduct of Dropbox’s “infrastructure optimization”, in which user data was moved from third-party service providers to co-location facilities Dropbox manages and leases. Now that the initial efficiency gains and transfer are complete, costs are expected to rise again. The company notes in its S-1 that its plans to increase the capacity of its infrastructure to support user growth, which will cause cost of revenue to begin increasing again. Transitioning to its own leased facilities does not eliminate costs. It just moves them from the income statement to the balance sheet. While cost of revenue fell $22 million in 2017, the company’s off-balance sheet debt from operating leases totaled $973 million. This off-balance sheet debt dwarfs (346% of net assets) Dropbox’s reported net assets and the cost savings touted by management, but must be taken into account when valuing Dropbox. Meanwhile, Dropbox’s sales & marketing expense (28% of revenue in 2017) is growing faster than it appears. Dropbox reports its sales & marketing expense grew 25% YoY in 2017, which is below the 31% growth in revenue. However, on page 77 of its S-1, Dropbox reveals that due to a modification of an executive stock grant in 2016, sales & marketing expense included a non-operating $18.8 million charge. When we remove this one-time charge, we see that Dropbox’s sales & marketing expense grew 35% YoY in 2017, or faster than revenue growth. For a firm that touts its ability to attract users via word-of-mouth and product referrals, it is alarming to see sales & marketing rising faster than revenue. Despite Dropbox providing colorful & positive charts (which provide little analytical value) in its S-1, the numbers reveal that Dropbox’s negative margins may get worse moving forward. Steve Jobs once told Dropbox co-founder Drew Houston that online storage would be a “feature” of cloud platforms, not a product or business. Many years later, it would appear that the late Apple co-founder’s words ring true. To diversify its business beyond simple file storage, Dropbox has developed new services such as Smart Sync, Sharing features, and collaboration tools such as Dropbox Paper. The development of these features also pits Dropbox against a larger group of competitors including Alphabet (GOOGL), Microsoft (MSFT), Amazon (AMZN), Apple (AAPL), Box (BOX), Atlassian Corporation (TEAM) and other productivity/collaboration apps such as Asana or Slack. Per Figure 1, each of the competitors we currently have under coverage are vastly more profitable, with the exception of prior Danger Zone pick Box (BOX). Not surprisingly, the profitable competitors offer file storage and collaboration as free features of their larger software products or operating systems. In the past, Dropbox has largely offered a consumer-focused and free file storage and sharing platform. When first introduced in 2007, access to files across multiple devices wasn’t as widely available as it is today. However, as operating systems such as Mac, iOS, and Android grew in popularity, and business productivity software moved to the cloud, (Office 365 for example) file sharing became a commodity accessible nearly everywhere. In an attempt to reach profitability, and not just grow its user base, Dropbox has begun introducing features to cater more towards enterprise users. Unfortunately, many of these services have already been invented by others. In each of its key markets, Dropbox faces strong competition. Figure 2 provides a snapshot of the competitive landscape in the file storage/cloud access market. It’s also worth noting that Amazon Drive provides unlimited photo storage for Prime users while Google Drive offers unlimited photo/video backup via Google Photos. The integration many of these services have with each other also challenges future growth potential for Dropbox. Microsoft Office Online is available for free, with just a Microsoft account, and provides access to its full suite of Office products, such as Word, Excel, and PowerPoint. Microsoft Office 365 is available for just $9.99/month and increases available OneDrive storage to 1TB and provides 60 minutes of Skype calls each month. Box is already partnered with Microsoft to offer its products through Microsoft’s Azure cloud platform. Google’s G-Suite of products integrates directly into Google Drive so files can be created, managed, and shared all within Google’s online interface, which also works on most mobile devices. Apple’s iWork suite integrates and syncs with iCloud, which comes free of charge on all iPhones, iPads, and Macs. Ultimately, as a standalone provider, Dropbox needs the money generated from file sharing, storage, and collaboration simply to continue operations. Meanwhile, its largest competition can take losses on these features while operating profitably in other product lines, software offerings, or both. This competitive disadvantage will provide a consistent headwind and make it harder for Dropbox to justify its valuation. How Can Dropbox Justify Its $7 Billion Valuation? Unlike other tech IPOs, Dropbox’s business is not in the “startup phase” and has instead been operating for over a decade. Now, just over 2% of its large user base provides the firm any revenue while the remaining 98% eat away at profits while being “potential” customers. We find it unlikely that long-time non-paying Dropbox users will suddenly begin paying the firm given there are plenty of other places to get the same service for free. In order to reach profitability, Dropbox needs to either cut costs, increase the revenue generated from existing users, increase overall paying users, or some combination of the three. With costs expected to rise (as noted above), the first option seems unlikely as the way to achieve consistent profitability. Increasing revenue generated from existing users could improve margins if we assume the customer acquisition costs are lower. Meanwhile, increasing overall paying users would provide a boost to revenue, but may not improve margins if a subsequent increase in cost of revenue or operating expenses follows. As it stands, Dropbox generates $111.91 in average revenue per paying user, which is down from $113.54 in 2015. If we look at its entire user base, Dropbox generates just $2.21 per user. 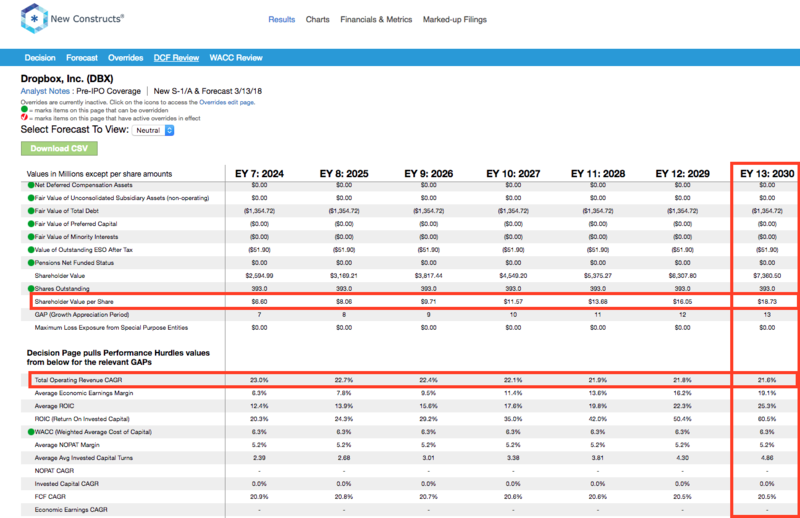 Dropbox’s operating expenses per user are higher and average $2.44 per user, which results in the losses noted above. Dropbox notes in its S-1 that paying users receive additional customer support, which puts pressure on Dropbox’s support organization. If Dropbox wants to increase its users, it must also increase its support structure while also increasing its infrastructure to support the increased storage limits provided to paying users. In both cases, paying users cost more than non-paying users. Given the average revenue per user, we can model multiple scenarios to see how many users Dropbox needs to justify its expected valuation. 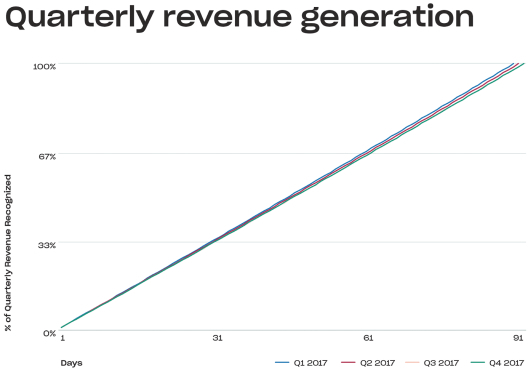 Scenario 1 – A Perfect Storm: This scenario assumes that Dropbox is able to curtail costs (despite evidence on the contrary) to improve margins, while maintaining impressive revenue growth. 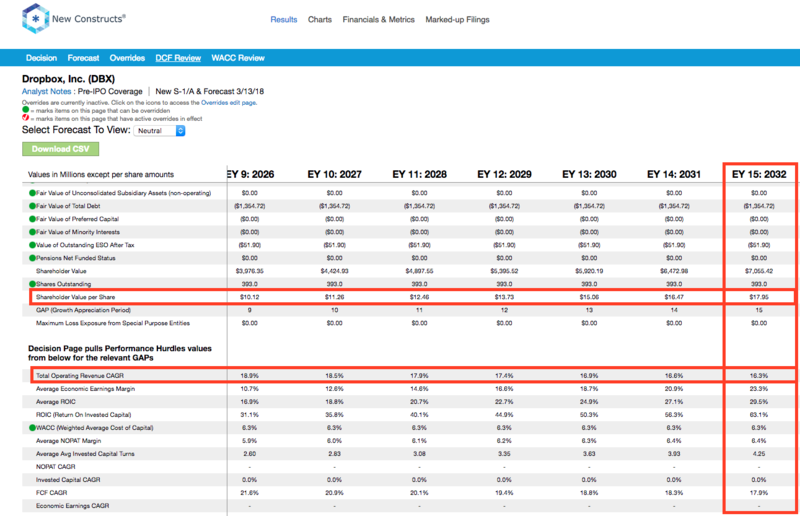 To justify its current valuation in this scenario, Dropbox would have to immediately improve NOPAT margins to 5% (average of firms in Figure 1) and grow revenue by 22% compounded annually for the next 13 years. In this scenario, Dropbox would be generating $14.1 billion in revenue, which, at current per user averages, implies the firm would have over 126 million paying users. For reference, Microsoft’s Office 365 had 120 million users in October 2017. 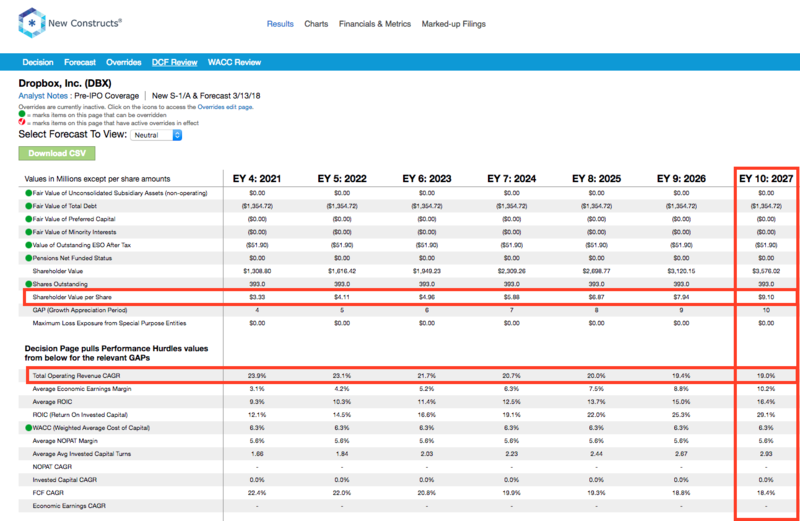 Scenario 2 – A Focus on Profitability: This scenario implies that Dropbox focuses on improving margins rather than growing revenue at breakneck speed. To justify its current valuation in this scenario, Dropbox would have to improve margins to 7% over four years and grow revenue by 16% compounded annually for the next 15 years. In this scenario, Dropbox would be generating $10.6 billion in revenue, which implies the firm would have 95 million paying users. There’s no way to generate the cash flows implied by the IPO valuation without the company simultaneously improving margins and growing revenue. Even if we assume a scenario between the two above, in which Dropbox achieves a 6% NOPAT margin and grows revenue by 19% compounded annually for the next decade, the stock is worth only $9/share today – a 47% downside to the midpoint of Dropbox’s price range. It’s also worth noting that each of these scenarios assumes DBX is able to grow revenue and NOPAT/free cash flow without spending on working capital or fixed assets. This assumption is unlikely but allows us to create very optimistic scenarios that demonstrate how high expectations in the current valuation are. Ultimately, Dropbox’s success will be determined by its ability to increase revenue-generating users in a highly competitive market with many free alternatives. Should Dropbox fail to report impressive revenue growth alongside increasing paying members, the stock’s valuation could see a fall after the IPO hype wears off. 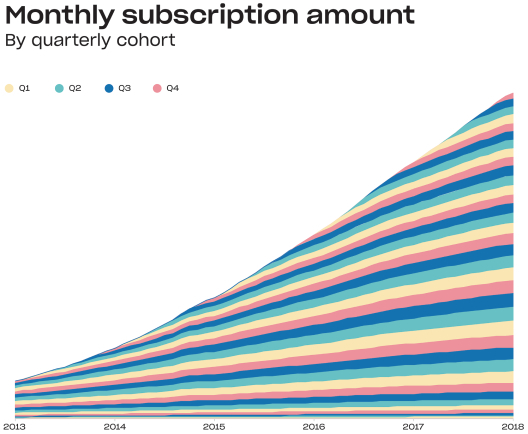 We’ve seen what can happen to a free service that struggles to grow users such as Twitter, which at one point was down nearly 80% from its highs achieved shortly after IPO. As soon as investors get any signs that Dropbox’s path to profitability remains littered with pitfalls, we think its valuation could sink. As with many tech stocks, there is always a risk that a larger competitor will come in and acquire DBX at a higher price than the current valuation. However, even in an event that an acquisition bid was received and in the best interests of shareholders, Dropbox’s corporate governance, and particularly its voting structure make the approval of such an acquisition unlikely. Dropbox CEO Drew Houston has spurned acquisition offers in the past, and the firm is now set to go public at a lowered valuation than it received just a few years ago. 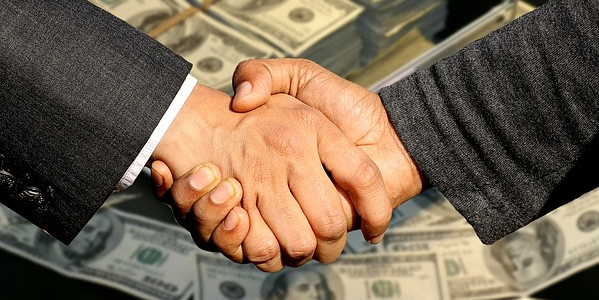 Unless early investors and the co-founders are willing to take a possible cut in what they believe the firm to be worth, an acquisition seems unlikely. Dropbox is exempt from certain disclosure requirements because it confidentially submitted its registration statement to the SEC before it reached criteria that would exclude it from being an “emerging growth company”. One of these exemptions relates to disclosures on executive compensation. From the information provided, we can tell that Dropbox’s executives receive non-equity bonuses tied to revenue and free cash flow goals. We’ve demonstrated through numerous case studies that ROIC, not revenue or free cash flow, is the primary driver of shareholder value creation. A recent white paper published by Ernst & Young also validates the importance of ROIC (see here: Getting ROIC Right) and the superiority of our data analytics. Without major changes to this compensation plan (e.g. emphasizing ROIC), investors should expect further value destruction. Income Statement: we made $83 million of adjustments with a net effect of removing $57 million in non-operating expense (5% of revenue). We removed $13 million related to non-operating income and $70 million related to non-operating expenses. 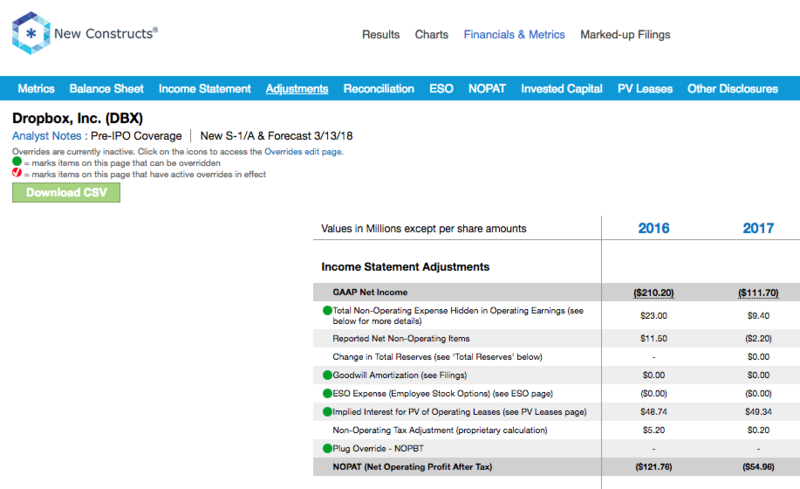 See all the adjustments made to DBX’s income statement here. 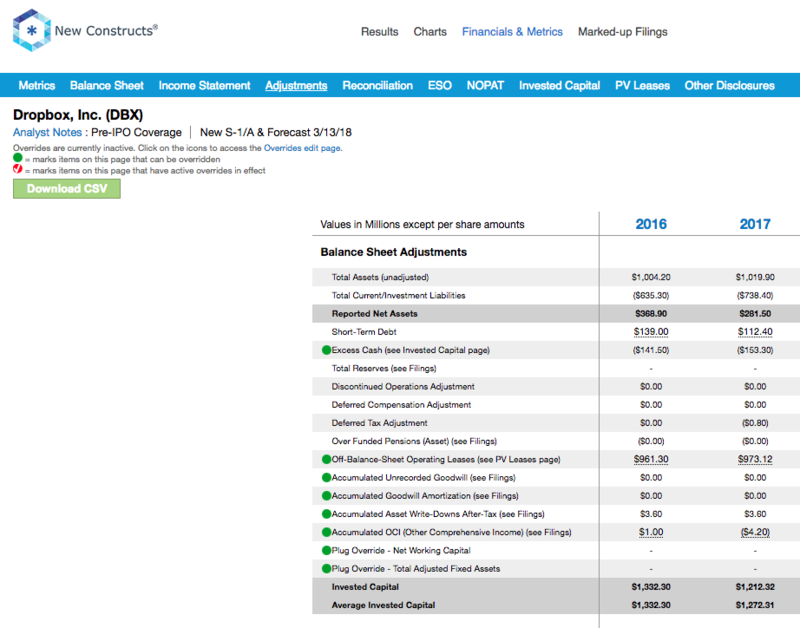 Balance Sheet: we made $1.3 billion of adjustments to calculate invested capital with a net increase of $991 million. The most notable adjustment was $973 million (346% of reported net assets) related to operating leases. 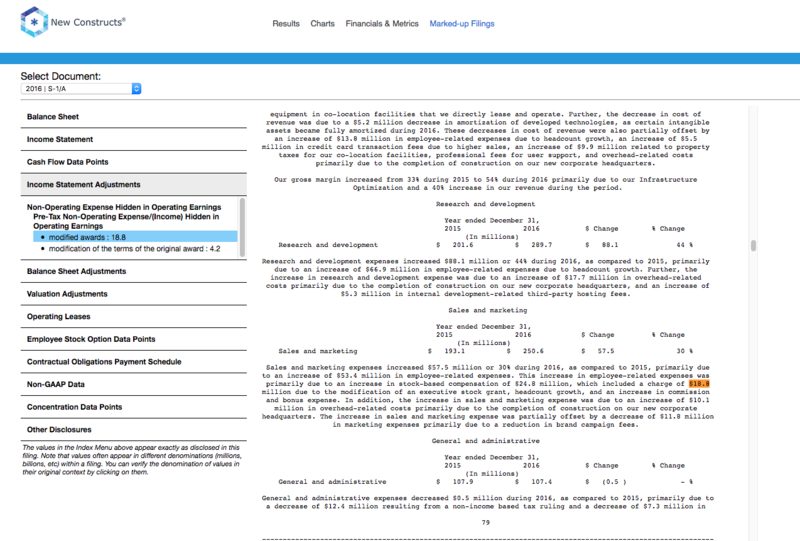 See all adjustments to DBX’s balance sheet here. Valuation: we made $1.6 billion of adjustments with a net effect of decreasing shareholder value by $1.3 billion. Apart from $1.4 billion in total debt, which includes the operating leases noted above, the largest adjustment to shareholder value was $153 million in excess cash. This cash adjustment represents 2% of DBX’s expected market valuation. This article originally published on March 19, 2018.